Frozen squid is a great choice even when fresh is available. Freezing and thawing help break down some of the tough muscle fibers making the squid more tender. Frozen squid is sold as tubes (cleaned bodies) and tentacles or already cut into rings for frying or other recipes calling for rings. 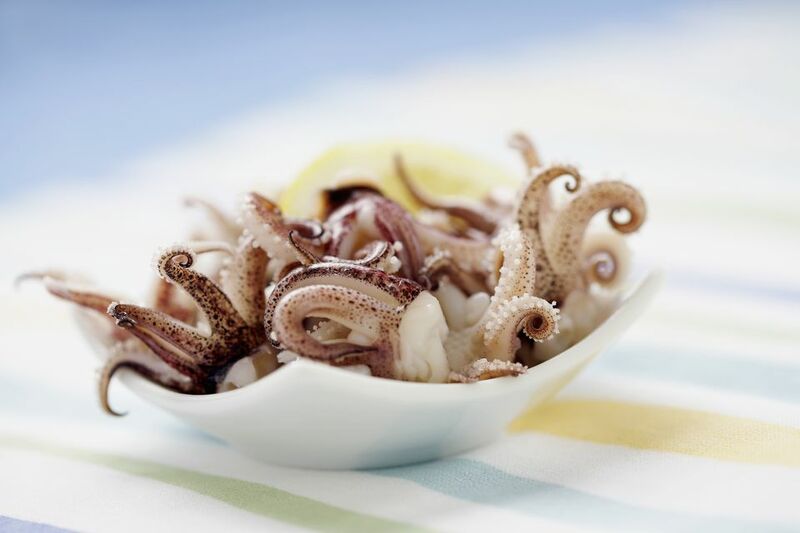 Follow these easy steps to defrosting and preparing the squid for cooking. Defrost squid overnight in the refrigerator or under cold running water (about 1 1/2 hours per pound of squid). If the squid needs to be cleaned, follow the steps in how to clean squid. If the squid has been cleaned, after thawing, run it under cold running water and run your hands around the rings, tubes, and tentacles to make sure no small pieces of sand or other debris remain. If not using immediately, store in an airtight container in the refrigerator. Once thawed, use within 3 days. Small frozen squid is generally more economical to buy whole in 5-pound boxes. To divide, partially defrost just until the squid can be removed.